Neolemonniera clitandrifolia is a tree of the Sapotaceae family and resides within the forests of West Africa. The tree can reach a height of 35 metres with the trunk measuring 90cm in diameter, its lateral roots can also be quite far reaching covering the surrounding forest floor. Neolemonniera clitandrifolia produces a large fruit containing its seed. The fruit is edible as a pulp but due to the amount of latex it contains, it can be very sticky, in some cases causing the consumers mouth to glue shut! The tropical forests of West Africa provide suitable habitat as the tree prefers humid atmospheres. N. clitandrifolia is a tree of many different uses. 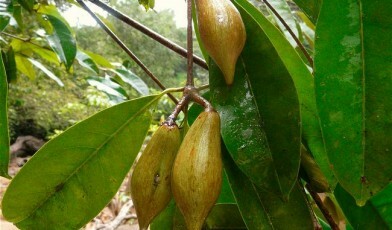 The fruit can be used directly as a food source as well as being converted into an oil. The oil is similar to coconut oil and can be used for cooking as well as in beauty and cosmetic products. The species also produces a good source of timber. Although it isn’t the easiest to work with, it is strong and durable making it a popular target for loggers, especially following the decline of other popular timber species. The tree’s utility combined with a loss of habitat due to land conversion for agriculture and mining means that the species is at risk, resulting in its status as Endangered. There has been an observed decline in population numbers. Hawthorne, W. 1998. Neolemonniera clitandrifolia. The IUCN Red List of Threatened Species 1998: e.T34806A9889609.http://dx.doi.org/10.2305/IUCN.UK.1998.RLTS.T34806A9889609.en. Louppe, D., Oteng-Amoako, A.A. & Lemmens, R.H.M.J., 2008. Plant Resources of Tropical Africa. Sussex: PROTA.